Get inspired to do yoga in the fresh air with these bird-themed poses. Try yoga outside with your kids. Doing yoga outside can add a whole new dimension to the experience. You get some vitamin D and connect with nature while relaxing and stretching your body. Stretching and focusing exercises are also a great option for parents who want to bond with their children. Even the most active child can find a moment of peace doing yoga with an attentive adult. 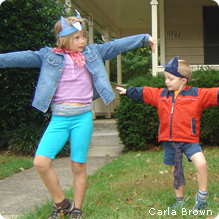 Many yoga poses are kid-friendly and they particularly like poses where they pretend to be like an animal. You can really make it fun by play-acting with them. Here are three bird-themed yoga poses that your family might enjoy. Practice your balance with flamingo pose. To do the flamingo pose, start by standing up straight and tall. Then take one foot and slowly step it back behind you. Put out your arms straight out from your shoulders like flamingo wings. You can hold them still or flap them gently. Holding them still is easier. Slowly tip your body forward so that all your weight is on your front foot. Your back foot slowly rises from the ground. It does not need to rise very high off the ground. Hold the pose while you breathe in and out deeply through your nose. Children may find balancing like this difficult. Teach them to pick a spot on the ground about 10 feet away and focus their eyes on it. You can even have a “focus object” such as a pine cone for them to fix their eyes on. Also, at first, they can just keep their big toe on the ground. The number one goal is to hold still, and not tip side-to-side or forward and back. After holding the pose for a comfortable length of time, slowly adjust your weight back to two feet, and then pull in your back foot so you are standing tall again. Switch feet and do the balance on the other side. Stretch your inner thigh with crow pose. Start by standing straight and tall on both feet. Lift your arms so they extend straight out from your shoulders. Bend your hands at the wrists so the fingers point down to the ground. They should hang loosely from the wrist, not a rigid bend. Bend one of your knees and stand that foot on tippy-toes. Turn the knee out from your body. Hold the pose for a comfortable amount of time with breathing through your nose. Your child may have some challenges holding still. Again offering them a “focus object” such as a pinecone can help them relax. After some time, bring your arms down and knee in. Then switch to the other side. Stretch up tall with stork pose. Begin this pose by standing straight and tall. Lift one knee up. The toes can stay on the ground, or you can bring them higher on your calf. My daughter tended to lift her knee but her foot then bent behind her. This is not correct. Put your toes either on the ground, or on your calf. 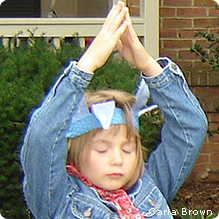 Bring your hands together at your chest in a type of prayer pose. Your elbows should stick straight out like stork wings. Slowly raise your hands above your head with your hands still together. You can close your eyes during this pose, but it might challenging to keep your balance. It is more important to be smooth and relaxed than to lift your foot high off the ground or close your eyes. Hold the pose for a comfortable amount of time while breathing through your nose. Slowly bring your arms and leg down until you are standing tall again. Switch to the other foot. 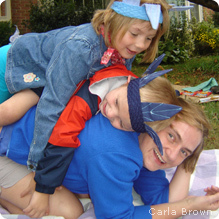 During the photo shoot for this activity, my son invented a yoga pose which he called “egg pose.” It involved mommy curling into a ball like an egg and having the kids pile on! It was a fun pose. Curling up into a ball and relaxing is actually very close to a real yoga pose called “child pose.” Child pose is a great way to end any yoga session, to allow the participants to center themselves and listen to their breath. Our version was just a bit more raucous. 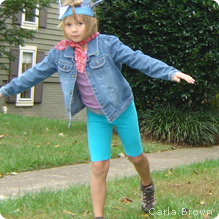 Encouraging your child to have fun with yoga is key to making a successful outdoor experience. So encourage them to invent their own yoga poses and let us know what they come up with in the comment field below!